It is 96 degrees F today with about 95 % humidity and I just got a new Pendleton catalog. I am spending an extremely boring evening watching the Help Desk try to get rid of a Trojan Horse on my computer ( we are now initiating a scan of 185,000 files for the third time, yawn), so it has provided the ideal entertainment. There are dozens of other lovely items - I have been very self-c0ntrolled and limited myself to a few coats and boots...... Rim Rock Duster - a bargain at $458 - and the handcrafted Sinchos boots are only $498! 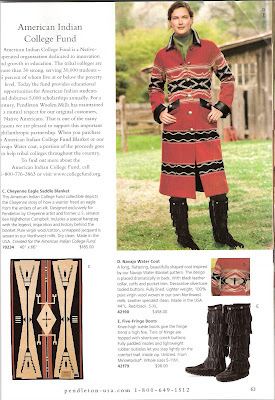 ........ and the Navaho Water Blanket coat worn with Five- Fringe boots (these are a real bargain at $98) Sales of the Water Blanket coat benefit the American Indian College Fund - a very worthy cause. Sadly I cannot justify spending this kind of money when I don't have a job. I tell myself that since none come in XS that they would be too large anyway.